The Met Office are about to upgrade the warning from yesterday to an 'Amber' level for snow mainly for the western half of the Scottish Borders from 5pm this evening until 10am tomorrow, travel may be disrupted and we would advise that you tune into Radio Borders for the latest travel updates as we will be linking up with them and providing information from the Bunker at Council HQ. A cold and increasingly showery northwesterly flow is expected to develop during Wednesday and last through Thursday. Accumulating snow is likely away from windward coastal districts, especially overnight. Across Northern England 3-6 cm could accumulate especially over high ground. Over Scotland and Northern Ireland 5-10 cm is likely even at low levels, with more than 10 cm over high ground. Strong and gusty winds will likely accompany snow showers, and lead to significantly reduced visibility at times, difficult driving conditions and temporary blizzards over high ground. ..... we can now confirm that the new blades for the Langhope Rig wind turbines are on their way to Grangemouth and are scheduled for delivery to the site over a period of roughly 8 weeks starting in early February. Planned delivery dates will be confirmed and communicated in due course, however if there are any dates that would be problematic due to community events / other local plans please do not hesitate to get in touch and we will do our best to avoid this day. Between 09/12/14 and 10/12/14 thieves have stolen a white cattle lorry and a Honda quad bike from a locked shed on a farm near Hawick. Both vehicles were subsequently recovered abandoned on the Bonchester to Carter Bar road. The Met Office has issued a yellow warning for the Borders for high winds from midnight tonight through to 6am on Thursdaymorning. The public are being asked to be vigilant and take extra care over this period as there is a risk of fallen trees during this prolonged period of high winds. Scottish Borders Council (SBC) and Police Scotland have held a teleconference with the Met Office to be advised of the latest situation. The snow showers during tomorrow and Monday, any accumulating snow is likely to be restricted to higher ground, with any travel disruption mostly confined to the usual prone areas. Our Yellow Warning of Snow has just been updated, and now incorporates an ice risk too. It continues to highlight a medium likelihood of low impacts. Looking a bit further ahead, stormy conditions are still forecast for midweek, with very strong winds, heavy rain and high seas. An Alert has just been issued for this. Between 4:30 pm on 21st November and 9:30 am on 22nd November, thieves have stolen a red Honda Quad Bike from a farm near Bonchester Bridge. Three chainsaws, a petrol hedge trimmer and a power drill were also taken from an insecure shed. Total value of items stolen is around £6000. 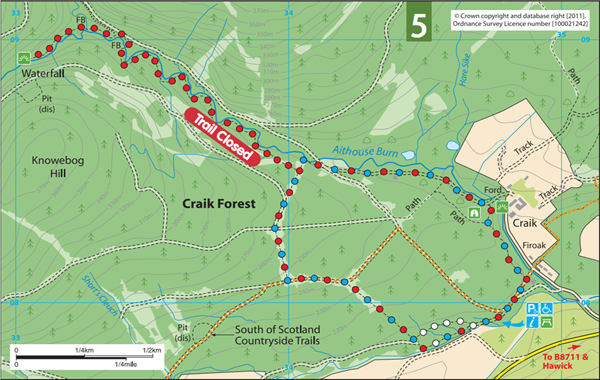 The Borthwick Water Community Development Trust chairman Ashley Butlin recently had a meeting with a representative from the Forestry Commission and the following is the latest on the Craik Forest public access situation. 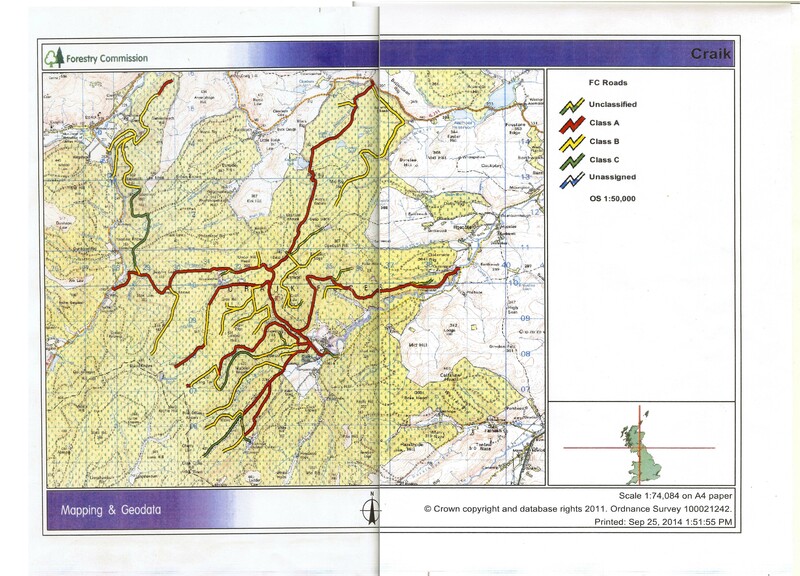 The Forestry Commission WILL be keeping the walking routes shown on the attached image OPEN and ACCESSIBLE. The waterfall route (marked CLOSED on the image) will NOT be maintained as the costs to maintain this route, which has become extremely dangerous due to land slides, are excessive. It is hoped that a new route will be opened to allow viewing of the waterfall from above. However, under the right to roam, any part of the forest can be reached except when logging is taking place and areas are prohibited for safety reasons.